The Distance Harness is an X-Back style, designed for maximum comfort for the working dog! The original design is 1" nylon webbing with a 3,800 lb break strength which keeps the overall stretching to a minimum. The padding is triple thick 300 weight fleece covered with a water resistant nylon oxford fabric that runs all the way back to the tail. For those that prefer a lighter harness you now have the option of choosing the race weight webbing with a 1900 lb break strength and two different options for padding. Choose either fleece covered with a water resistant nylon oxford fabric or neoprene foam covreed with a water resistant nylon oxford fabric, both are padded to the tail. 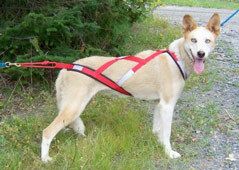 Because of the design the Distance harness stays in place, which helps minimize armpit and hip rubs! 24" of 3M Reflective Tape sewn on is included and located at the neck, sides and tail. The tug ropes are color coded to the size of the harness and graduated for an easy fit into the gangline. Stock colors for the 3,800 lb break strength are red webbing with black padding or blue webbing with black padding, for the 1900 lb break strength black webbing with blue padding or red webbing with black padding. We do have other padding colors available such as red, green, teal, purple, yellow and orange and welcome you to contact us for a special order! Note lead times will vary on custom orders. Fleece Padding starts at 23.50 and Neoprene Padding starts at 26.50.